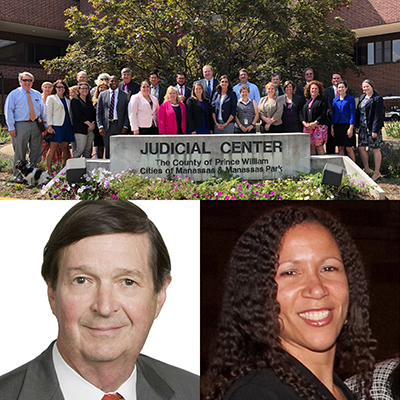 The Virginia State Bar will host the 2018 Pro Bono Conference on October 17, 2018 in Norfolk. The event will include three free CLEs for a total of four hours credit (pending), and will be followed by a dinner featuring keynote speaker Eve Runyon, President and CEO of The Pro Bono Institute. Runyon, a graduate of the University of Virginia and Yale School of Law, helped to implement the Corporate Pro Bono Challenge® initiative, which helps in-house law departments expand and measure their pro bono endeavors. The dinner will also honor this year’s pro bono award winners: Andy Nea of Williams Mullen who won the Lewis F. Powell Jr. Pro Bono Award, and the Prince William County Bar Association which won the Frankie Muse Freeman Organizational Pro Bono Award. All Virginia lawyers are invited and encouraged to attend. More information may be found here. Caption: (clockwise from top) Members of the Prince William County Bar Association; Eve Runyon of the Pro Bono Institute; and Andy Nea of Williams Mullen.